The standard ruling in Euphoria is that when rolling doubles (or triples, etc.) – you may place all workers showing the same number as a single action. This places a heavy emphasis on luck, as a few lucky rolls can severely change the outcome of the game. As such – a suggested house rule (that is fully endorsed by the publisher) is that when rolling doubles – you may still place the workers in a single turn, but at the cost of 1 morale per extra dice place. This variant helps mitigate luck, is thematic (as you’re driving your workers harder that you should be) and greatly improves the play experience. 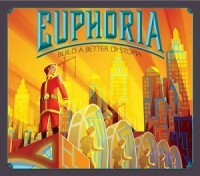 At the beginning of Euphoria you’re tasked with selecting your recruits. It’s a game full of decisions and planning, but this one is probably the single most impactful. You have to pick 2 out of 4 recruits dealt to you and discard the other 2 from the game. You’ll naturally want to pick the recruits with the best abilities, but more important than the powers will be faction allegiance. There are 4 factions in the game – Icarus, Subterra, Wastlands and Euphoria, and each recruit belongs to one of these. If any two of the 4 recruits given to you match factions, it’s best to take them even if there’s a recruit of a different faction with a much better ability. I personally love any ability that can give me an extra resource each turn early in the game. But if the recruit with that ability is Euphorian, and my other choices are an Icarite and two Subterrans, I’m taking the Subterrans. This will allow you to place 2 authority tokens (you need to place 10 to win) when your faction’s allegiance meter hits maximum. This is usually a game-deciding difference.